was a large theropod from the Late Cretaceous. It is famously found in the dinosaur-rich, Horseshoe Canyon Formation of Alberta, Canada. Albertosaurus lived where the Western Interior Seaway had periodically retreated, 76-70 mya. It had the large head and two-fingered claw of other tyrannosauroids. Its teeth have specialized cracks which gave the tooth additional strength while Albertosaurus pulled flesh from its prey. Albertosaurus is a tyrannosauroid. It is a member of its own genus and is not a member of Tyrannosaurus. Albertosaurus had more teeth than larger tyrannosaurids. A. sarcophagus is the type species and derives its genus name from the range it appears to be restricted to. This range is the province of Alberta, Canada. Albertosaurus was an apex predator, possibly occupying different niches as it matured. Albertosaurus adults likely weighed 2-3 short tons, which was much less than T. rex. Fossils from 26 individuals have been discovered in one site, suggesting possible pack behavior. Albertosaurus lived among diverse populations of dinosaurs and other fauna. Albertosaurus has made several television appearances including Primeval: New World and a segment on Jurassic Fight Club. Albertosaurus had a large head and tiny hands with two digits that are popularly recognized on tyrannosauroids. It was bipedal and had a long tail. Smaller and sleeker than T. rex and Tarbosaurus, it was still larger than many theropods. Albertosaurus could grow 33 feet (10 m) long, though 30 feet (9 m) is considered a typical length. It was 11 feet tall at the hip. Estimations place its weight between 2-3 short tons. had a shorter (flatter) skull and shorter ilia (hip bones) than the tyrannosaurines. Like other theropods, Albertosaurus had long legs and three toes on the ground. The shortest digit, the hallux, was the first digit of four and did not usually contact the earth. The middle toe on the ground was the longest. Albertosaurus is believed to have walked between 8 and 13 mph (14-21 km/hr), with a maximum speed of 30 km/hr. A possible top speed of 40 km/hr has also been suggested. Juveniles would have run faster than adults. Albertosaurus had a skull which was 3.3 ft (1m) long. Its short neck was S-shaped. Above its eyes, protruded short crests of bone which would have looked like blunt horns. Spaces in the skull called fenestrae provided locales for muscles to attach, made room for sensory organs, and also lightened the head. Albertosaurus had eyes which looked more to the side than Tyrannosaurus, making Albertosaurus less effective at judging distance. Albertosaurus was a heterodont (different forms of teeth for different functions in the mouth) with 14-16 teeth in the lower jaw, and 17-19 teeth in the upper jaw. Teeth were serrated, shaped like bananas, and differed significantly in thickness as the animal aged. There were four, smaller premaxillary teeth in both sides of the upper jaw. They were D-shaped and packed in closely. The maxillary teeth could resist lateral forces produced by prey and models suggest a bite force of about 3413 N. This compares to computer models of T. rex which estimate the T. rex bite force as 35,000-57,000 N.
Serrations of the teeth are very thin and resemble cracks. The empty, round space of an ampulla is at the base of the crack. The void allows the distribution of force across a greater surface area. This property prevents the crack from getting bigger. Such cracks have been observed in other predators such as Dimetrodon. Rather than slice meat off of prey, tyrannosauroids pulled meat away. The forces involved would compress the teeth toward the front of the mouth. Ampullae would diffuse such forces and would have prevented cracking on the posterior side of teeth which experienced tension from the pulling motion. In 2001, studies conducted by William Adler revealed the significance of the cracks and ampullae. Using drilled plexiglass, he demonstrated the strength advantage of having such spaces. Bone histology has been used to determine growth rates for Albertosaurus and other tryrannosauroids. Fossils have revealed that a two-year-old Albertosaurus was 7 feet long and weighed about 110 lbs (50 kg). The oldest and largest Albertosaurus found was about 28 years old. As in other tyrannosauroids, the fastest growth rates occurred over a four year period which ended at approximately 16 years of age. Two years into a growth spurt that added 268 lbs (122 kg) per year, juveniles and their adult counterparts would have been the largest predators in their region (based on adult weight of 1.4 short tons). Growth continued at a slower rate throughout the life of Albertosaurus, though sexual maturity is believed to have begun after the four year growth spurt. There are several reasons proposed for the lack of Albertosaurus juvenile specimens. Most specimens have lived fourteen years before they died. Preservation bias and collection bias are two influential considerations for current theories. Preservation bias is when younger animals have smaller bones which have a tendency to escape preservation. Collection bias is when collectors overlook the smaller bones of a juvenile. Albertosaurus juveniles are larger than many other juvenile animals, which suggest that their rarity has more to do with life history than bias. Hatchlings may have had high rates or mortality. However, juveniles were considerably large after just two years and may have been so effective at survival that very few juvenile individuals died. This would explain the lack of fossils found for that stage. Periods of rapid growth beginning at age 12, and again at the beginning of sexual maturity (14-16 yrs old) are expressed in the fossil record with a doubling of mortality rates at each of these stages. The higher mortality rates continue throughout adulthood. This pattern of mortality is also observed with large mammals. Some reasons for increased mortality include competition for mates and resources, territorial disputes, and the demands of reproduction. Other tyrannosauroids share a similar mortality pattern in the fossil record. Since most Albertosaurus specimens come from one area, bias must not be ignored. The age ranges and state of preservation of the specimens in the Dry Island bonebed are factors used to conclude that the animals died together. There are very few remnants of herbivores at the site. Phillip J. Currie asserts that these details are signs of possible pack behavior. Other scientists, including Currie, submit that the animals could also have been together because of rising flood waters or drought. 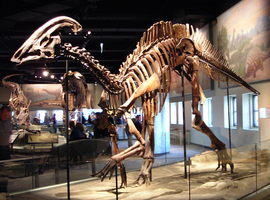 There are several sites where theropods such as Allosaurus have been found with other individuals of their species. These sites have been explored as proof of gregarious behavior. Alternative explanations for the aggregations are also proposed. One explanation is that predators engaged in carcass-mobbing and aggressive behavior that led to death and cannibalism at the sites. The behavior of Komodo dragons has been used as an example. Albertosaurus may have moved up to 30 km/hr and may have used a ‘bite and slice’ tactic against large prey. Currie notes that Albertosaurus youth had leg dimensions which facilitated speed. Currie suggests that such speed could have been utilized in pack hunting. The hypothesis is that the swift and youthful pack members drove prey to the larger, slower, yet more powerful adults. Juveniles may have also subsisted on different prey than the adult Albertosaurus, reducing inter-species competition. Such niches may have been available since Albertosaurus, even as a juvenile, was much larger than the other theropods in its community. Theories regarding the partitioning of predator niches and hunting strategies are difficult to prove. Paleopathology has provided some insight into Albertosaurus life. Trichomonas gallinae is a parasite that effects birds. A similar parasite may have been responsible for the smooth-edged perforations found in the jaws of tyrannosaurids. The infection would have been transmitted by biting, and would have made eating difficult. Tendon avulsions and stress fractures have been observed in other theropods. Especially compared with Allosaurus, Albertosaurus had significantly fewer such stress injuries. The specimens of Dry Island have been relatively free from disease. 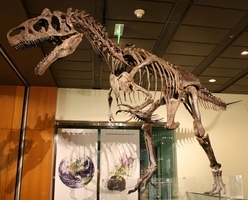 Some specimens of Albertosaurus have been found with injuries such as broken bones, bites, ossification of tendons, and bone spurs. Albertosaurus lived 76-70 mya , during the Late Cretaceous. Specimens are most commonly found in the Horseshow Canyon Fm. The younger sediments of the Horseshoe Canyon Formation in Alberta, Canada, are from the Late Cretaceous. They are the early Maastrictian stage and date from 70 to 68 mya. As the Cretaceous came to a close, the Western Interior Seaway was receding. The climate had been cooling and as a consequence, sea levels dropped and exposed land. This process is represented in the Bearpaw Shale which rests below the Horseshow Canyon Fm. The sea levels rose and fell throughout deposition of Horseshoe Canyon sediments. While this formation records marine and coastal habitats, coal seams, lagoons, and swamps, Albertosaurus is found within delta and floodplain deposits. The fossils are preserved in the more recent half of the formation, as the seaway moved toward permanent recession during post-Horseshoe Canyon times. The North Atlantic and South Atlantic opened in the Cretaceous and the continents became recognizable from a modern perspective. Albertosaurus was an apex predator among the dinosaurs which dominated the Horseshoe Canyon Fm. Hadrosaurs including Edmontosaurus were plentiful in this formation. Numerous ceratopsians, ornithohominids, and several species or carnivorous theropods were also part of the communities. The giant Sauropods of the Jurassic had been disappearing by the Cretaceous and were replaced by smaller herbivores. Ankylosaurians and pachycephalosaurs were present but rare. A small theropod called Albertonykus was found in the Dry Island bonebed among Albertosaurus. The marsupial Didelphodon lived among the fauna, as did the rodent-like multituberculates. Flowering plants evolved to gain the attention of insects and they proliferated during the Cretaceous. Fish fauna such as sharks, rays, and gars also lived at this time. Plesiosaurs lived in the salt water while turtles and crocodilians could be found in fresh water. The Cretaceous-Paleogene Extinction Event occurred about 65 mya. Dinosaurs and large marine reptiles became extinct at this time. 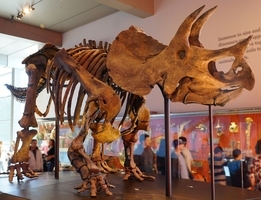 Possible causes of the mass extinction include an asteroid impact which would have created widespread fires and a photosynthetic crisis from debris aerosols and ash. Regional volcanic catastrophes may have also contributed to climate change and extinction. Albertosaurus belongs to the family Tyrannosauridae. There are two sub-families in the family Tyrannosauridae. These sub-families are Tyrannosaurinae and Albertosaurinae. The Albertosaurinae sub-family currently contains two species Gorgosaurus libratus (Albertosaurus libratus), and Albertosaurus sarcophagus. Albertosaurines had smaller skulls, longer tibia, longer metatarsals, and longer phalanges than members of the Tyrannosaurine sub-family. They also had a more slender build than tyrannosaurines. The first Albertosaurus was discovered in 1884. The partial skull was retrieved on a geologic survey expedition led by Joseph Burr Tyrell. His colleague, T. Chesmer, discovered parts of a skull and pieces of a skeleton in 1889. These specimens were from the Horseshoe Canyon Formation in Alberta. Cope assigned the type specimens to the preoccupied genus of Laelaps, and still awarded the name Laelaps incrassatus. O.P. Hay used the name Dryptosaurus as the species genus in 1902. By 1904, Lawrence Lamb had described the remains and awarded them the species name of Dryptosaurus incrassatus, following Lamb’s example. In 1905, Osborn renamed the type specimens Albertosaurus sarcophagus. Osborn observed that connections to Dryptosaurus were based on tyrannosauroid teeth which were too generic to confidently associate them with the Tyrell and Chesmer’s specimens. Osborn also noted dissimilarities between their Albertosaurus type specimens, and those of Dryptosaurus. In 2010, Thomas Carr pointed out that the holotype, paratype, and specimens discovered later shared a unique trait. The shared trait was a large opening in the back rim of the palatine bone. This trait separates Albertosaurus as its own genus. Since Tyrell’s discovery, more than 30 specimens have been studied. Such abundant material has revealed many details which are impossible to surmise for other groups. In 1913, the Dinosaur Park Formation yielded a tyrannosauroid that was named Gorgosaurus libratus. It was found in the Alberta sediments by C.H. Sternberg and named by Lawrence Lamb in 1914. Because of the limited skull material available for Albertosaurus, there was little evidence to separate the taxa. In 1970, G. libratus was renamed A. libratus. One reason that the species have been considered separate is because A. libratus lived several millions years earlier and hundreds of kilometers farther south. In 2003, P.J. Currie used details of tyrannosauroid skulls and new information regarding theropods to declare that while Albertosaurus and Gorgosaurus were most closely related to each other, they were different enough to be separate taxa. Currie pointed out that the new albertosaurine discoveries in Alaska and New Mexico may provide new insight. Meanwhile, some scientists refer to Gorgosaurus as an Albertosaurus, and others discuss them as separate genera. Albertosaurus discoveries were made for over 40 years. Since the 70s, there has been an increase in recovered specimens. Several discoveries of tyrannosauroid specimens have been attributed to members of Gorgosaurus or Albertosaurus genera. Several have been renamed as their similarities to Tyrannosaurus or other genera were revealed, or distinguishing traits have since been considered as juvenile characteristics of previously described species. The greatest known concentration of Cretaceous theropod bones which has been discovered is along the Red Deer River which flows by Drumheller, Alberta. In 1910, Barnum Brown and his team collected pieces of skeletons from 9 separate individuals of Albertosaurus. Due to limited time, Brown had to leave much of the site unexcavated. In 1997, the Royal Tyrell Museum of Paleontology rediscovered and continued work on the bonebed. By 2005, thirteen more individuals were identified from incomplete skeletons. The specimens include a two-year-old and an aged, 33 foot-long adult. The number of individuals at the site could be as few as 12. If ontogeny was responsible for size differences, there could be as many as 26 individuals at the quarry. The site is now called the Dry Island Buffalo Jump Provincial Park. Insight into the Albertosaurus genus continues. Alectrosaurus olseni is a theropod discovered in Mongolia. Some scientists believe that it is an Asian species of Albertosaurus. The controversial theropod, Nanotyrannus, was formerly known as Albertosaurus lancensis.